Turkey is one of the greatest places to take a road trip. It is a diverse country, rich in history and natural beauty, and there is a lot to explore. We spent two weeks driving from Istanbul along the black sea from Akçakoca to Kastamonu and driving back inland via Safranbolu. We ate delicious food, swam in clear waters, and got lost in one of Turkey’s largest national parks! We arrived at Istanbul Sabiha Gocken airport at lunch time. We organised a rental car and set off on our adventure of the Black Sea Region. Our first stop was Akçakoca. By Google maps it should have taken us 2 hours to get there. Driving out of Istanbul on the highway was easy enough, and we found people drive very quickly in Turkey. Big tour buses driving over 100km/h were overtaking us! However once the highways end and you move into the region of Dulze it gets interesting. A lot of new roads have been built in this area, which our navigation system was unaware of so we ended up going down a lot of dodgy roads and getting lost. Akçakoca is a charming beach town famous for its geometric and pointy looking mosque. During the evening we heard the Muezzin of the mosque singing from the top of the minaret. Even though he sang in Arabic we understood he was calling the people to come to the mosque and pray, which happens 5 times a day. We were very thirsty and hungry when we arrived at Akçakoca and after a walk through the town we went to the wharf area where the boats were coming in after a day of fishing. There are several seafood restaurants here with outside seating although most of them do not serve alcohol. We went to Balic Insalte for dinner because it was the busiest. We shared a house salad, a dish called Kidasi, which is a seafood stew with beef stock and cheese, and a plate of Hamsi, which are small grilled anchovies and a specialty of Akçakoca. Cheap accomodation is not easy to find here. 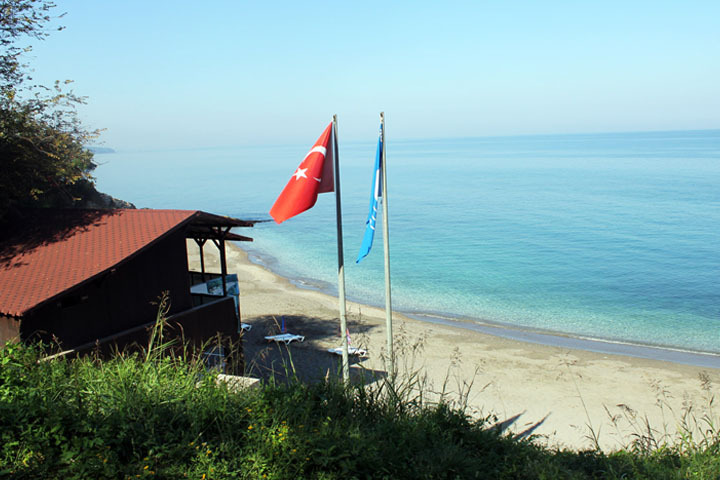 We spent a while driving around looking for somewhere to stay until we came across Otel Akcasehir. They charged 80 Turkish Lire for a double room including breakfast. The place also had a bar, restaurant and internet access. The owner is Ayhan Yazar, who is very friendly and we spent the remainder of our evening chatting with him and drinking the Turkish poison of choice – Rayki. Rayki is made from grapes and aniseed and it smells like licorice. It is very strong and 1 part is usually mixed with 3 parts of water. You should sip Rayki slowly and it is recommended to drink it with snacks such as cucumber and dill yogurt or fried Hamsi. And make sure you have a glass of water nearby to cleanse your palette, as like I said, it is a strong drink! The next morning Ayhan prepared an amazing breakfast of fried eggs served with fresh bread, home made butter, traditional cheeses, olives and tomatoes. He then showed us the way to Kale Plaji, the main beach of Akçakoca. Kale means castle in Turkish and Plaji means beach. At Kale Plaji there are the remains of an old Georgian castle. Below the castle on each side are two beaches, one beach for women and the other beach is unisex. At this point Ayhan waved us goodbye after expressing his surprise at our desire to swim. For the locals, September is too cold for swimming. We went to the unisex beach and the sand was dark and gritty but under the water there were smooth rocks. The water from the Black Sea is very clear and not too salty. We then left Akçakoca and hit the road and drove towards Zolungandak, a busy city centre with cars driving in every direction. 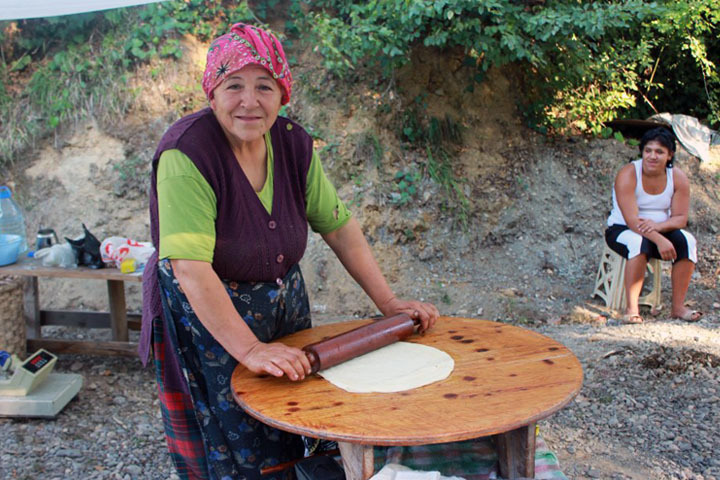 We passed by the ruins and dirty beaches of Filyos, where we saw gypsies living in a caravan making music, and we stopped by the side of the street to purchase traditional gozleme cooked by local women. We finally reached our destination Amasra, a popular holiday spot for Turkish people and on arrival we went for a swim at the main beach. The water was not so clean as there were lots of jellyfish, seaweed and rubbish, but this did not seem to bother the other swimmers. Afterwards we were approached by some women enquiring if we were looking for a pansyon, which means accommodation. We thought to give it a try rather than going to one of the hotels. They took us to a residential apartment that was close to the beach and consisted of two bedrooms, two bathrooms and a combined kitchen and dining area. We paid 160 Turkish lire for two nights, which was a bargain and all we needed to do was leave the keys on the table when we left. That evening we went to one of the bars near the main beach with lovely outside tables right on the water. Luckily the menu was in English as well as Turkish. We saw that a glass of champagne was only 12 Turkish lires, which is very cheap, so we ordered that. After about 10 minutes the waiter came back and started asking us questions in Turkish, which we could not understand. He then went away and came back 20 minutes later with a strange bottle with no label and two glasses, and he poured us the “champagne”. It definitely was not champagne and it tasted like watered down cider. We guessed they must of made it especially for us. As we did not really like it we then decided to order two glasses of white wine. Again it took a really long time for the waiter to find some wine, but when he eventually bought it out it did taste like real wine. The lesson we learnt was that in these parts, people don’t really drink wine and it is much safer to order beer or spirits. 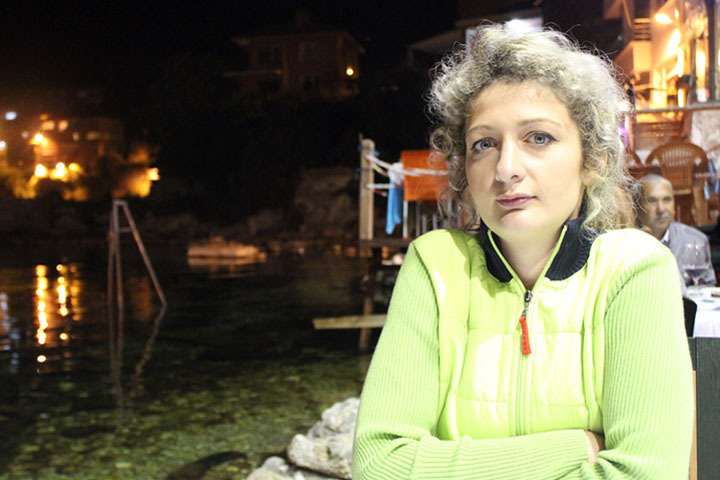 We chose a popular restaurant called Amasra Canll Balik Restaurant on the opposite side of the town centre to have dinner and we sat at a table on the water amongst the rocks. In the evenings it can get cold so the staff gave us blankets to keep on our shoulders. 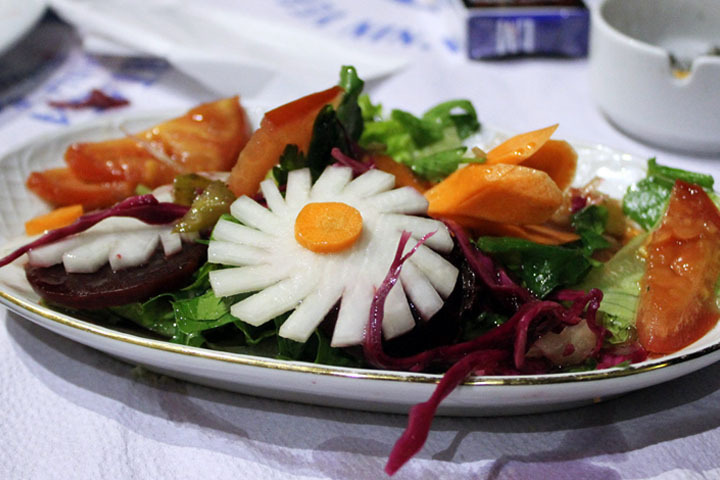 We ordered an Amasra salad, which is the specialty dish of this area, and it consists of cabbage root, beetroot, carrot, lettuce and tomato and is arranged in a very decorative way. We also ordered fried mussels served with dill yogurt which were really delicious, and sauteed prawns. The food and service were excellent. We then headed to Bar Han, which plays live music in the evenings. The band consisted of a singer, guitarist, drummer, violinist and keyboardist and they were a huge hit with the crowd. The drummer at times would break away from the band and walk among the audience playing the drums. He would also put the drum on someone’s head and play it for tips, which we assumed must be a Turkish tradition. It is rude to tip the drummer coins and you must only tip with notes. We ordered some gin and tonics, which were super strong and consisted of much more gin than tonic – two of these drinks would definitely send someone over the edge! We had a good time here. We spent the whole day in Amasra. In the morning we went to the main beach for a swim and a sun bake. The sun was strong and after two hours we started to get sunburnt. In the middle of the day we visited Amasra castle. The castle is situated at the top of a hill and it is mostly ruins now, although a lot of the castle wall remains intact. From here you can see a great view of the city below. Near the castle there is also an interesting church made of brick and a small mosque in a similar style. As you continue past the castle you will come to a bridge. 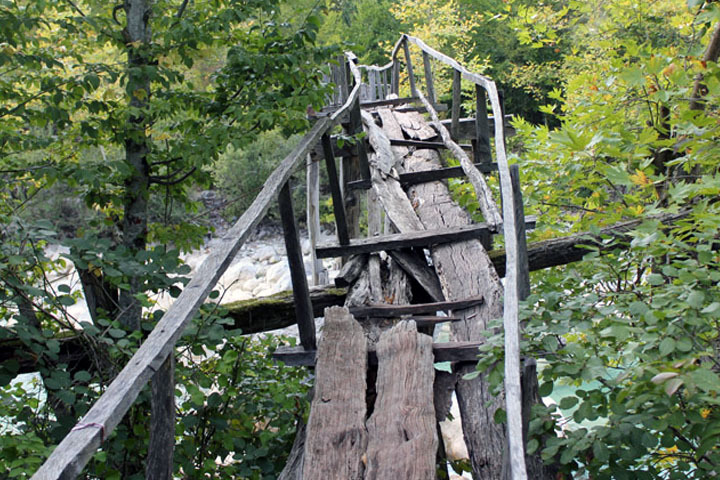 Around this bridge are two sets of stairs leading down to rocks on either side. People sit on the rocks to sun bake and there are stairs to go down into the water as well. If you are a strong swimmer, the water is much cleaner here than the beach. If you cross the bridge on the other side you then have the opportunity to take some nice walks along the side of the cliff for stunning views and cafe hopping. In the town centre there are two market streets in Amasra, one is near the park and consists of old women selling home-made jams, pickles, fruits and nuts. The other market is a street in the middle of the town with stalls selling souvenirs and lots of trinkets made from shells and wood. There is also a well known corner shop where the owner sits outside and carves figurines. For dinner that evening I ordered fresh Palamut fish cooked Bonito style at a busy restaurant in the middle of town. Palamut is the most popular fresh fish in these parts and it is served sliced into thick rings and fried. On day four we hit the road again and headed to Cakraz. 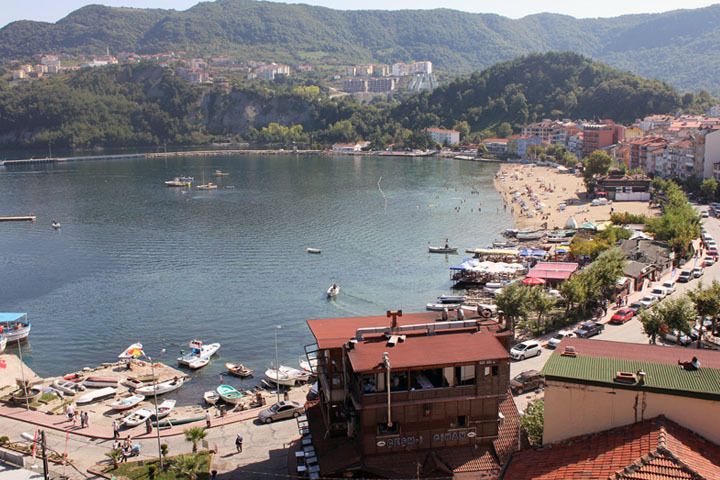 It is a very small town with a beach and it was also the first Black Sea town we had come across with an internet cafe. After a small stop we then went for tea at Gideros, where we saw a beautiful view of a rocky cove complete with small fishing boats. The owner of the cafe was extremely hospitable and insisted that the tea was on the house! Right next to Gideros, down another slope, is Gideros Koyu (which means village) where you can go for a swim amongst the rocks. The water is very clean and it was my favourite place for a swim because the area was so idyllic and the water is deep and still. Upon the recommendation of the cafe owner at Gideros, we backtracked a short distance to Kapasuyu to check out the beach there. 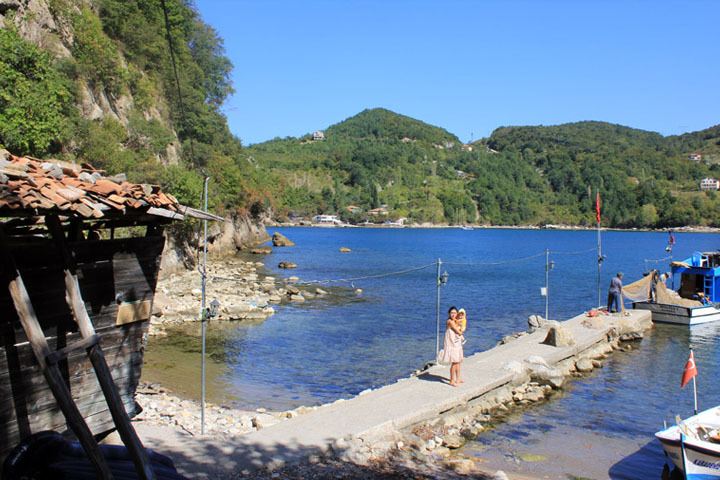 This beach, although small, was far superior to those at Amasra because it had clean water and the waves were big. We had good fun swimming here and there were lots of dogs on the beach that we played with too. One little puppy tried to run away with my towel! We then headed off the main road down a rocky path for 6km to visit a secret waterfall called Golderesi Selalesi in Turkish. We needed to leave the car and walk down a steep path to see the actual waterfall. The rocks were loose and slippery and I fell down a couple of times. The waterfall was small and the water is freezing. 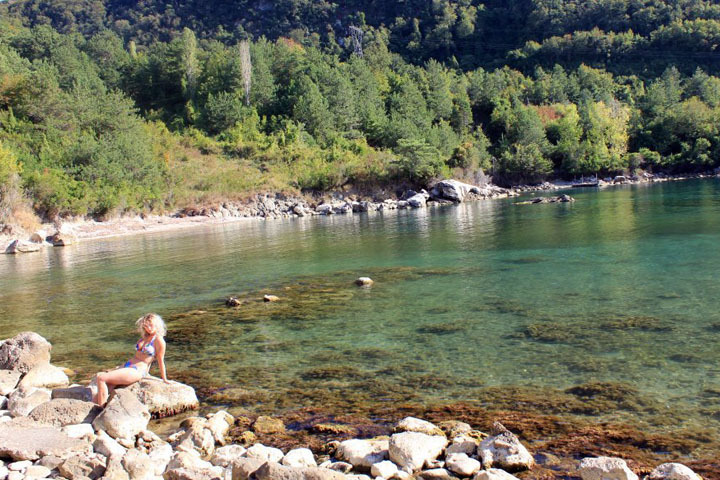 However it is a peaceful spot to have a picnic or a very cold swim! 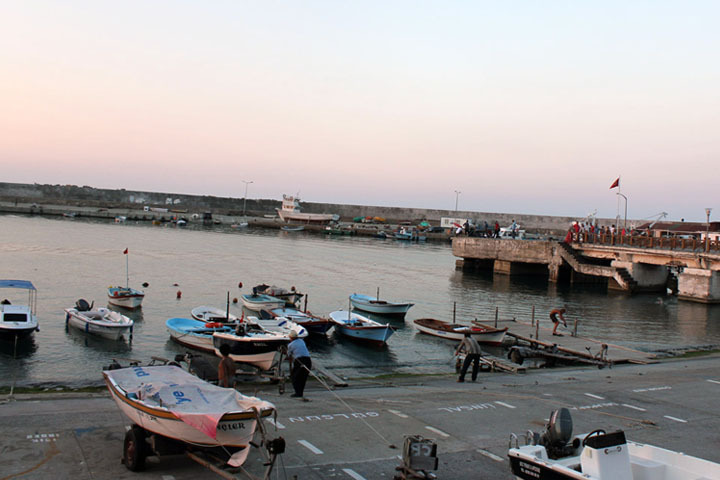 We then headed to the next main town at Cide for a bite to eat at the Yali Hotel, near the fishing wharf. The area was quiet and we sat outside so we could observe the activities at the wharf. There were not so many boats and people were buy packing up their fishing things for the day. We ordered Palamut served grilled with raw onion and lemon, and we had a garlic and eggplant salad with grilled red peppers. The owner spoke good English and she offered us some home-made Ayran, which was refreshing in the hot weather. The beach at Cide was the biggest we had seen so far, however it was not clean and seemed desolate, so we choose not to swim here. Instead we spent our time walking along the boardwalk and checking out the city centre. There is one amusement park, one nightclub, two hotels and two supermarkets in Cide. The city centre does not have a lot of offer. We rented a pansyon for a very cheap price of 50 Turkish lire, which had two bedrooms, a bathroom, laundry, balcony and kitchen. In the morning we headed back to my favourite place, Gideros Koyu, for breakfast. The lady prepared an amazing feast of cheese pastries, toasted sandwiches, fresh bread, honeycomb, Turkish cheeses, olives, tomatoes, cucumbers and home-made jams. We drank regular coffee with milk, which you need to order by asking for Nescafe. Coffee is not so popular in this region as everyone drinks tea, and occasionally after a meal they might drink Turkish coffee, both without milk. If you order Nescafe they will typically make it with powdered milk, however it is the closest thing to a latte if you are craving milk coffee. Very close to Gideros along the same main road is Gokekale. 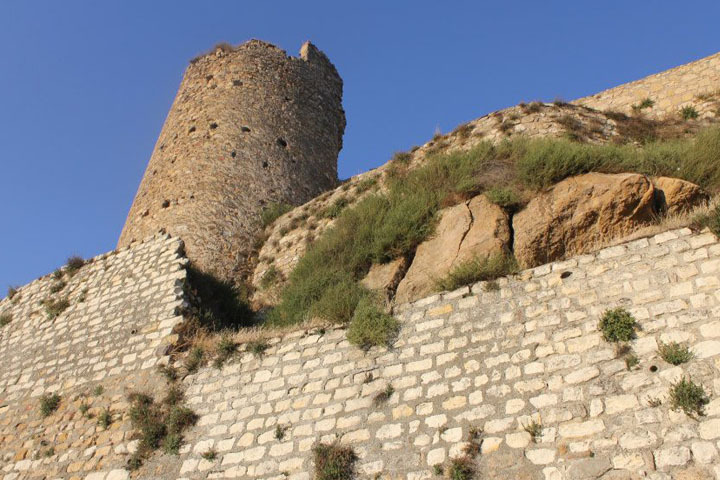 It is a small island in the Black Sea connected to the mainland by a small strip, where there used to be an old Byzantium castle. Today it is just ruins and you can see some stones left from the old castle. We then headed to Milli Digli National Park, known in the local language as Küre Dağları Milli Parkı to see the waterfall on the Kastamonu side. I must stress, never ever drive through this park unless you are with a local who knows the area and you have a proper four-wheel drive car that can survive it. The roads are terrible as they are very rocky and steep. There can also be obstacles along the road such as trees and large rocks. Getting to the waterfall was easy enough. We entered the park from the entrance close to Cide where there was a sign indicating the waterfall. We then drove down the hill and along twisting roads for about 10km until we reached a flat area. We were nervous about the lack of signs as we continued our descent, however once we had reached the flat area we became reassured by the monstrous sound of the waterfall and then continued our way by foot. If you are interested in visiting this site, be prepared for at least 90 minutes of hiking to see the source of the waterfall among trees, shrubs, rocks and also paths thick with clay. There is a very interesting bridge which you can also cross to the other side of the waterfall, which looks like something from Tomb Raider. It is very rickety and looks like it can collapse at any minute. We were too afraid to cross it, even though we saw an old grandpa using it. This area is really nice because the water is a clear light aqua gushing out over lots of rocks. We braved the chilliness of it to have a swim, which was refreshing. People do live in the National Park. There are small villages every 5-10 km (the park is absolutely massive) however they do not have any shops, just houses. There are quite a few cows as well as some dogs, chickens and other domesticated animals. Considering how difficult it is driving here, I was surprised to observe people drove ordinary cars. Leaving the site of the waterfall proved difficult. The road up was so steep and full of rocks that our car struggled to make it and stalled a few times. We wanted to go to Safranbolu next and our GPS recommended driving through the park to the other side to reach this city. It was our huge mistake to do this. We spent the next few hours driving aimlessly through the park and it began to get dark and we were running low on petrol. We were worried about having to spend the night here and needing to call for help. As it got dark, we noticed the number of cars on these roads increased (normally you can drive for a long time without passing anyone) and realised people were returning home from work. We needed to ask for directions if we were to escape this nightmare but this was difficult because no one spoke English and it took a while to make ourselves understood. We named every city we had visited to so far attempting to get directions. Eventually we urged for directions to “asphalt” at which point people exclaimed “Kastamonu” another major city further east. We had obviously driven more south east than we had realised because this was the opposite direction that we wanted to go in. But we just wanted to get to a normal road again! After struggling with directions out of the National Park we finally came to Kastamonu. Our poor car barely survived it as the breaks were making funny noises now and it was really scratched. 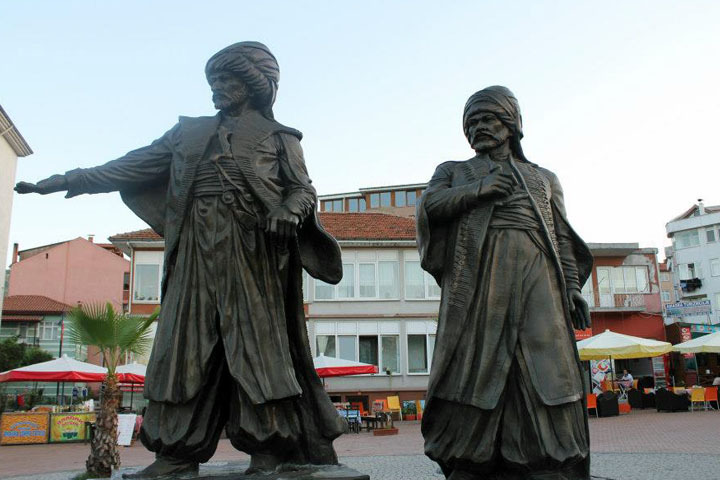 When first entering Kastamonu it seemed like a happening place because there were bright lights and shops everywhere. However this is an illusion. Lots of shops are closed, most of the bright lights are for advertising services in Istanbul, and the hotels are cheap and unappealing. We choose to stay at Otel Kale, which was cheap in price but one of the worst places I have stayed in. It had a bad smell and no lifts. We went up to our room on the third floor, which smelt of stale cigarette smoke and we were given slippers to wear because the floor is not clean in the room and especially in the bathrooms! The toilets are holes in the floor without any flush and no toilet paper. They were quite dirty. No soap was provided either to wash hands. On our floor there was one unisex shower for everyone to share. After our trials through the National Park what we needed more than anything was an alcoholic beverage! We asked the hotel reception where the nearest bar was, however they pronounced that there were no bars and Kastamonu is alcohol free. I am not sure how true this was, as we saw a Bufe (small shop) with advertising beer. But after walking the main streets we knew for certain that it would be impossible to order a drink in either a restaurant or a bar here. We found an okay restaurant to eat at on the main road, a couple of blocks up from Otel Kale, before reluctantly walking back to the hotel to go to sleep. DAY 6: BYE BYE KASTAMONU, HELLO SAFRANBOLU! 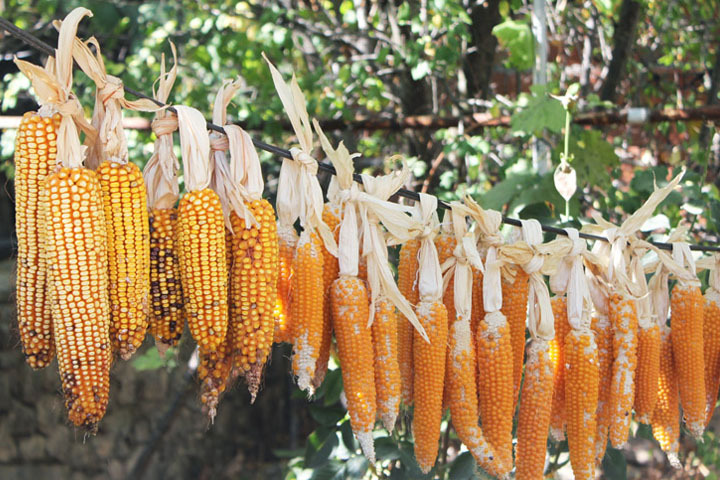 There is quite a lot to see in Kastamonu during the day. We visited the famous castle on top of the hill, which was originally Byzantine but had been captured and renovated by the Ottoman empire. We also visited the clock tower, which can be viewed from almost any point in the town. We then headed to Safranbolu. 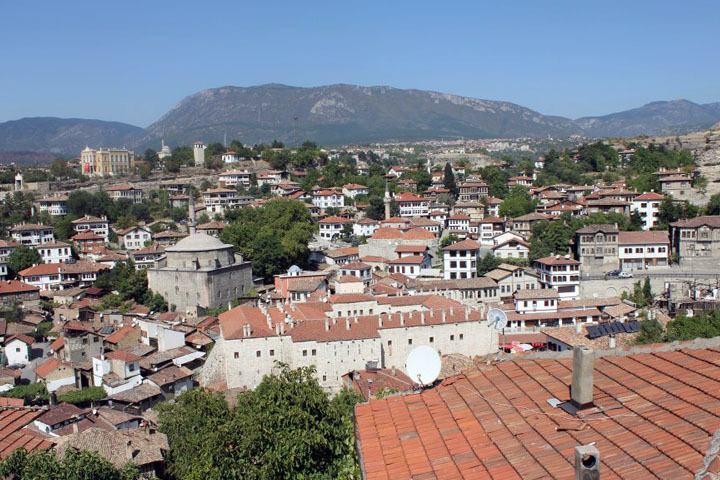 Safranbolu is a jewel of the Black Sea and listed on the UNESCO World Heritage List due to its well preserved Ottoman era houses and architecture. We spent the morning exploring the Old City and we really enjoyed the old-fashioned atmosphere of the place. We stopped at a small café for a breakfast of gozleme and Turkish tea. Tea is the popular drink of choice throughout Turkey and they serve it in little shapely glasses with a saucer, a small teaspoon and one cube of sugar. 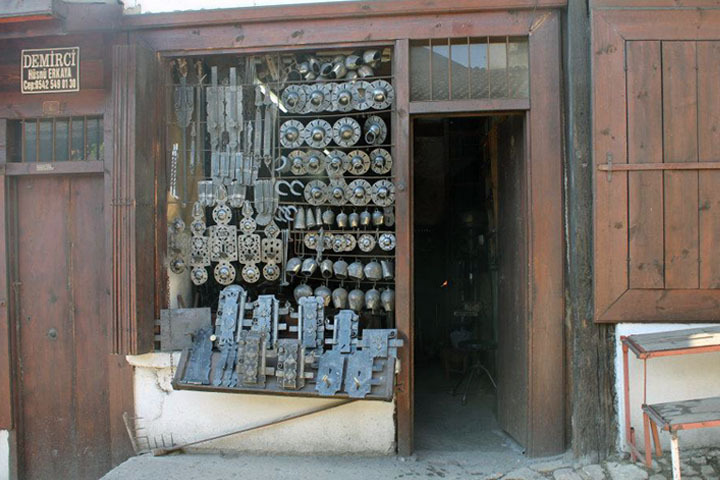 We then went to the Blacksmiths Bazaar, where we could see the men working hard to make metal items over burning flames. We then went to the museum house of Kaimakam, which has been preserved since the 18th century, and shows how Turkish society was during the time. Next was the Cinci Inn, which was particularly interesting for us because it used to be a popular tavern during the times of the old silk route, where merchants and traders used to stay. Today it functions as a hotel and we liked it so much that we decided to book one night’s accommodation here. 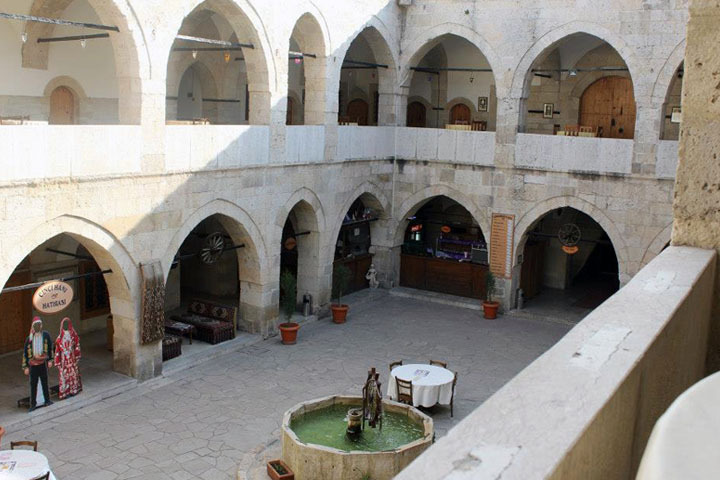 The place has beautiful arches, a little watermill in the centre, and some of the rooms depict Turkish society as it was using dummies and props. The rooms have very low ceilings and are quite dark though. 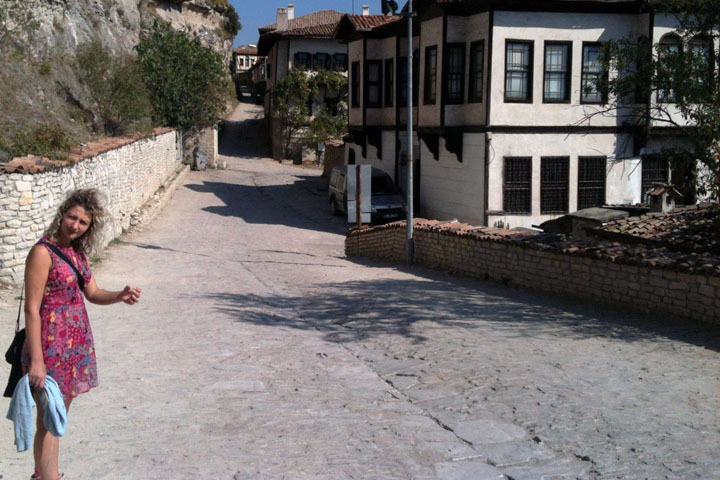 We then made a trek to the famous castle of Safranbolu, which requires a walk up a steep hill. In actual fact it is not really a castle, it is just called that by the locals, and is a relatively modern building that functions as a museum and stores documents, maps and photographs from the past 100 years. On this same hill is the beautiful clock tower. Clock towers are very popular in Turkey and there was a great exhibition showing models of all the famous clock towers in the country at its base. We then made another trek up another hill on the other side of the old city called Hidirlik Hill, which is the best place to see a panoramic view of the city and take photos. Upon this hill there is also an old tomb. We completed our tour of the old city by visiting the several beautiful mosques of the area, and by also visiting one of the many the candy stores, which sell sweets including Turkish delight, Helva, Sugared Almonds and Saffron Marshmallows. We bought several boxes of the saffron marshmallows, which contain a pistachio centre, because they taste so delicious. Safranbolu was named after the Saffron flower, because this is where the plant originally comes from, and it is unusual because it blooms in autumn rather than in spring. The plant consists of a red part – which is used to make Saffron tea in this region as well as in cooking – and the yellow part – which is also used in cooked and commonly used to make sweets. We then drove out of the old town and headed to the new town. 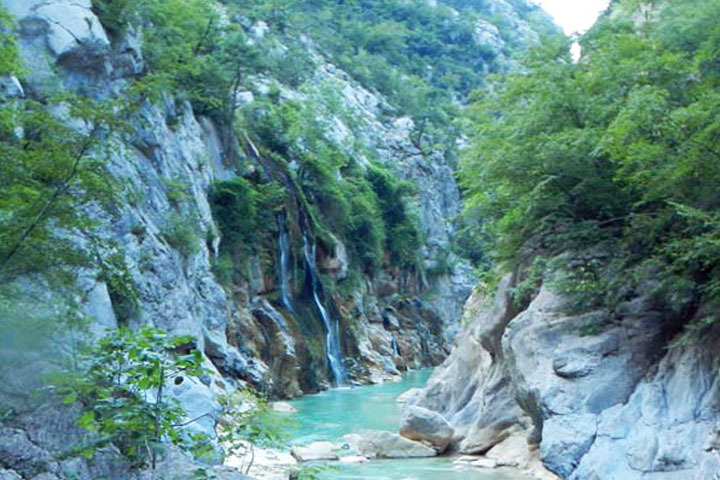 On the outskirts of the new town is the Bulak Mencilis Cave, which is about 6.5km in length and has underground rivers, ponds and waterfalls. You need to walk up many stairs to get to the cave entrance, and we were completely exhausted and hardly made it up. The place is supervised by an elderly man who is as fit as a fiddle because he is always rushing up and down these stairs. After the cave we headed to Yoruk village. 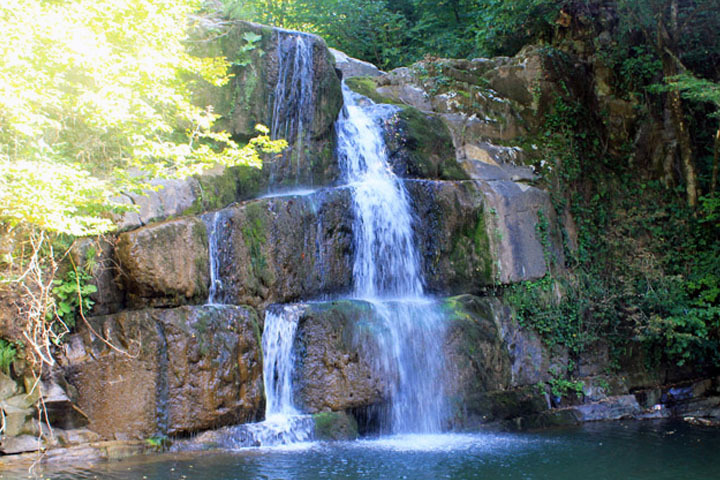 It is 11km from the centre of Safranbolu, just off the Kastamonu highway. 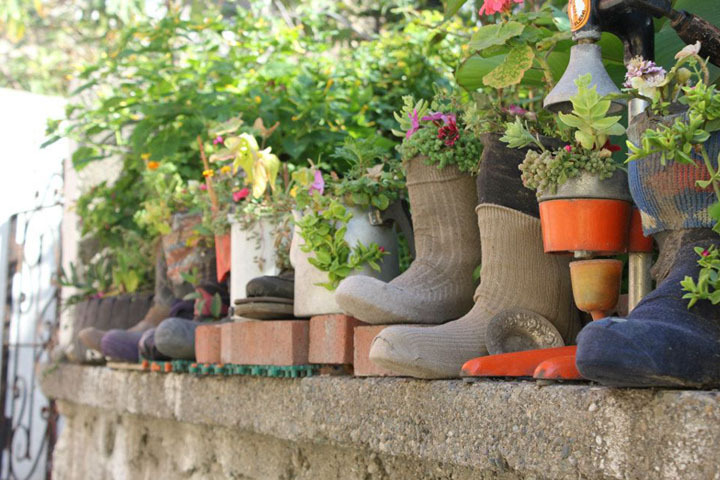 This village is like a mini versoin of Safranbolu, except there are less people. The buildings are all very old and preserved. It is under the protection of the Ministry of Culture, and shows a real Turkmen village as it was 750 years ago. The temperature was 41C so we found it challenging to wander around this village in the heat. There is just one small museum here, approximately 4 blocks from the entrance to the village, and is an old converted house that shows how people lived during the old times through its many props. The owner of the museum does not speak English but he managed to communicate with us very well through body language, and he gave us a mini tour. We then went to the main café of the Village, which is famous throughout the area, for having the best gozleme and home-made Ayran. We ordered a spinach and cheese gozleme, which we watched an old grandma make fresh. It was served with a pot of butter and a brush, so you could brush the butter on it to make it more tasty. The cold Aryan was so refreshing in the heat. Even though the village had hardly any people, this café was relatively busy. We even saw a group of businessmen dining here, who had driven into the village specifically for the gozleme. This is a testament to how good it is. There are many old rock tombs to see in the surrounding villages. However the roads leading to them are very rocky, without good signage, and our GPS did not recognise the locations. After our scary experience in Kastamonu, we decided not to risk trying to find them and headed back to the old town. After a busy day we felt that we deserved to treat ourselves to a Turkish Bath. The Turkish Bath had a section for women and a section for men. I went into the section for women, obviously, and was first directed to a change room and asked to remove all my clothing. I was given a linen cloth to wear and headed into the bath area, where I spent some time in the sauna. A lady then took me to a marble table and asked me to lie down. She scrubbed all the dead skin off my body, gave me a massage, and threw lots of water on me. She also washed my hair. This all took 30 minutes as she was very thorough. Afterwards I was given clean towels and some Turkish tea to relax. The experience was invigorating and I have never felt so clean in my life! It was now getting dark so we revisited Hidirlik Hill to see the city view by night. On the way down from the hill there is a wine bar. Wine is very rare in the Black Sea region so I insisted on stopping here. We sat down at the outside terrace and asked to see the wine list. The waiter informed us that actually they only had one bottle of red wine in stock. Well it was pretty disappointing for a wine bar so I opted for lemonade. 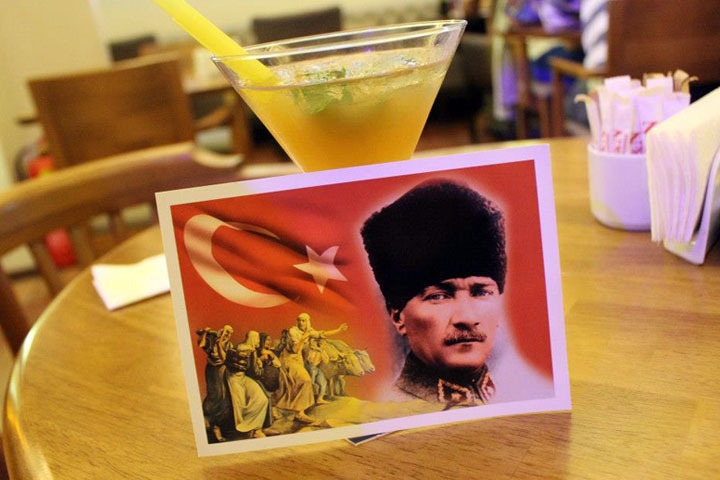 Lemonade in Turkey, also called Limonata, is not like Sprite. It is a very sweet lemon cordial drink that can be served with ice and fresh mint. For dinner we went to try some of the local cuisine of the region. We ordered Kuyu Kebabi, which is lamb that is cooked inside a well on wooden boards. The well is covered with muddy soil so the meat can cook in its own juices. The meat becomes very soft. We also ordered a traditional rice dish cooked with mushrooms and cheese. Afterwards we headed back our room at the Cinci Inn, and slept like merchants did during the times of the old silk road. We woke up early to do more shopping in the old town market. We purchased some red and yellow saffron for cooking, some saffron infused honey and drank saffron tea. The owner of the store also gave me a complimentary bottle of saffron perfume as a gift. We then hit the road to make a short stop at Sapanca. 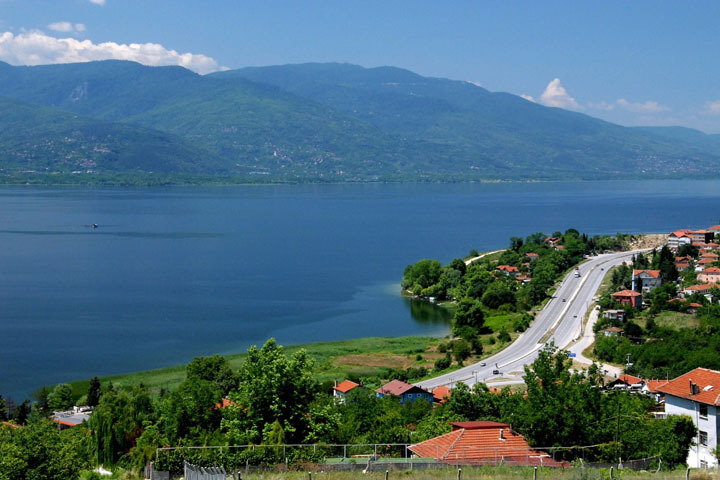 Sapanca is a lake district close to Istanbul, where a lot of bottled water is sourced. In recent times, it has become a popular place for Istanbul residents to escape to for some relaxation as there are many spas and posh hotels. We stopped at the southern west side, close to the highway. The water is very clear and clean, and unlike the Black Sea, it is also warm. Despite the good weather, we noticed that no one was swimming but we wanted to swim. People were walking along the lakeside and renting boats. We also noticed some veiled women, which made me feel nervous about swimming because I wouldn’t be properly covered. Although Turkey is a Muslim country, so far on our trip we had not seen anyone wearing a burqa, but we had seen some grandmas wearing a simple head scarf, which is typical for grandmas of any religion. The previous leader, Mustafa Kemal Ataturk discouraged the use of headscarves during his process of modernising Turkey during the 1920s and 30s. One tactic he used to do this was by announcing that headscarves were only to be worn by women of the night. Turkey distances itself from other Arabic Islamic countries and in recent years, although the use of the headscarf has increased again, there have been many attempts to ban it, especially in universities. We rented a boat to go out into the lake and then went for the lunch at one of the restaurants along the water. The restaurant was of a very top quality, with beautiful table-clothed tables, comfortable leather chairs, and waiters in white shirts and black jackets. We ordered lamb sish kebab for the first time. Apart from Safranbolu, we had found it almost impossible to order any lamb previously on our trip. The seaside towns mostly have fresh fish and sometimes chicken, they don’t have lamb. We also ordered a cold eggplant salad the accompany it. The food was fantastic. It was very fresh and very tasty, and the lamb was cooked to perfection. We enjoyed the meal very much. As we wandered back to the car we were approached twice by gypsy women selling roses. They were forceful in trying to make us take a rose and pay money. Even when we got into the car, the woman was tapping on the window so we locked the car doors. It was the first – and last – time on our trip that we saw such gypsies. As we drove through the town centre we noticed many more here and they were all carrying baskets of roses. We also passed their camp – the place where they lived – which was pretty obvious because it consisted of tents and caravans and there was lots of rubbish there. I thought it was very strange they all seemed to be living in this lake district. It was time to leave Sapanca and go to Istanbul, the city where east meets west and new blends with old. We were very excited. After our driving trials in the Kastamonu National Park, we did not expect to have any more problems however we found driving through Istanbul just as challenging. Drivers have little respect for the road rules. On the highway to Istanbul they were driving at high speeds but not keeping to any lanes. Within Istanbul, the pedestrians have no respect for cars and walk all over the roads. You need to beep your horn for them to move out of the way. Traffic can be very congested and there are many small winding roads in the residential areas that can be tricky to negotiate. 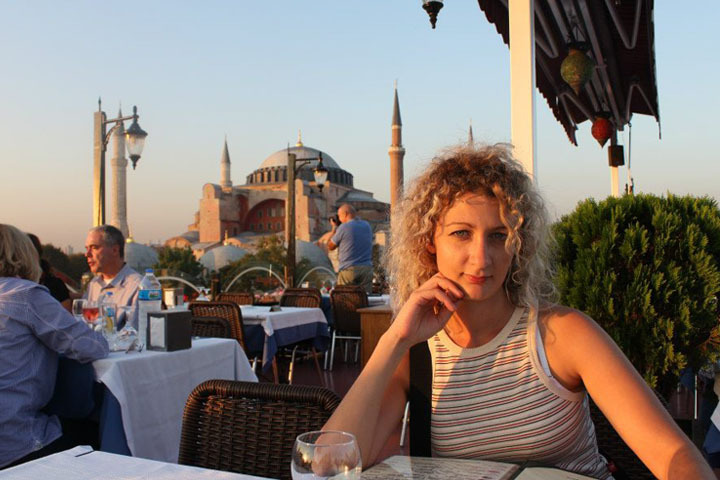 We stayed at the Serenity Hotel in Sultanahmet, close to all the main historical sites such. The hotel is expensive due to its location, but it is very simple. After dropping off our bags we arranged to have the car hire company collect the car. They said they would be there in 2 hours, so we went out for a walk. We went to the main hippodrome, where there are two huge Egyptian obelisks and from where you can see the Blue Mosque. The area was abuzz with activity. We choose a quiet café to sit down and unwind after the hectic car trip. As we went back to the hotel we passed a fruit and vegetable street market, setup in a car park where you can buy everything from potatoes, apples and peaches to fresh pomegranates and juices. There seemed to be lots of locals shopping there and a few tourists taking photos. When the company came to collect the car we were worried we would be charged a lot of additional money, because the car had undergone some extreme experiences during the rental period. Fortunately it was dark and the guy was in a rush, so we signed off the papers and he left without any further comment! We then went to the mini store to buy an Itanbulkart, which is a travel card for the public transport system, and took a tram to the new area of Beyoglu. This is where the best restaurants and night life is in Istanbul, and it is on the other side of the Galata bridge. You need to get off the tram at the first stop after the bridge and walk up a hill until you reach the Galata Clock Tower. The Tower looks very impressive at night, and this is a popular spot for young people to hang around in the evening drinking beer and wine straight out of the bottle. We were really hungry at this stage so we walked past the clock tower to a recommended restaurant called 8 Sofyali that specialises in mezes, which are small starters similar to tapas. We ordered a selection of mezes including eggplant salad, fresh anchovies, Turkish white cheese, and marinated octopus. We then shared a plate of lamb chops for main course. Throughout Turkey there are lots of cats, but in Istanbul the cats are noticeably fatter! Each restaurant will have its own cat that hangs around, and this restaurant was no exception. As we were eating our meal, we noticed a little furry paw on the edge of the table. The paw would disappear and reappear. Then suddenly a little furry head appeared. The little furry kitten looked at us very sadly, it seemed like he was starving, but his manners were very rude! We decided to give him a little bit of lamb and he was happy. DAY 8: WATCH OUT ISTANBUL, HERE WE ARE! Our hotel provided the typical Turkish breakfast, which is a buffet consisting of two types of local cheeses, 3 types of olives, fresh cucumbers and tomatoes, a selection of jams and honey, a type of ham (not made from pork) that is a bright red colour, and eggs. We then headed to the Grand Bazaar. 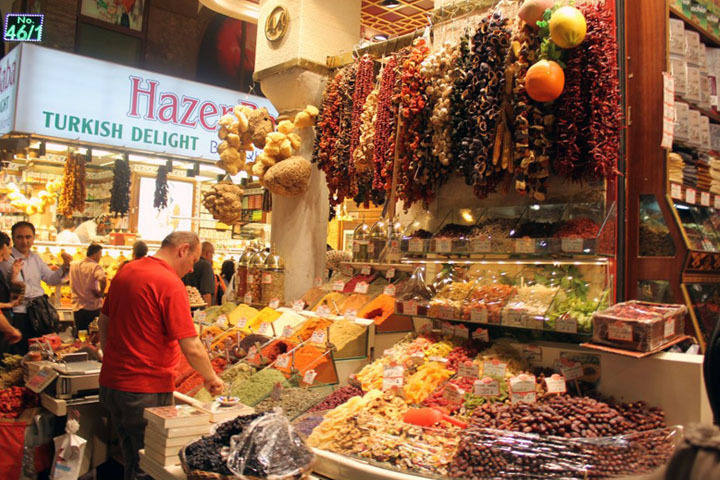 We knew in advance from other locals that the Grand Bazaar is expensive and we were encouraged not to waste our time there. The market sellers there pay their weight in gold for rent. Furthermore, if you are a tourist they will try to charge you triple. 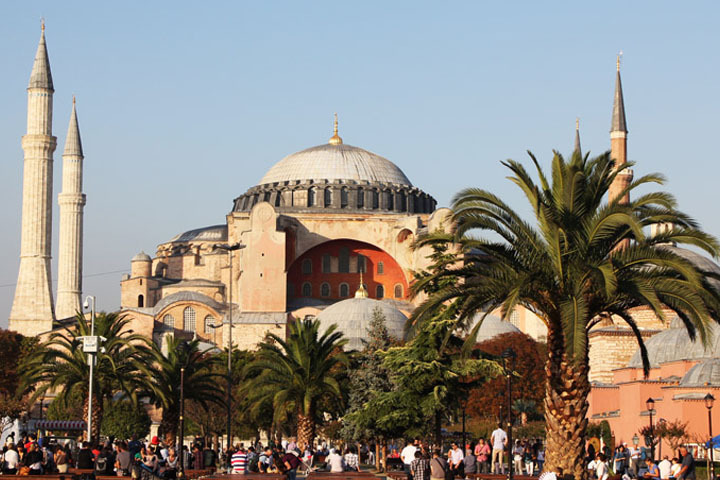 However we wanted to go for the experience as it is one of the most famous features of Istanbul. The market is all indoors and there are over 5000 different merchants. The most popular shops are for leather goods, jewelry, scarves and rugs. As owners are very keen to make money they speak all the main languages fluently including Italian, German, Greek, English, Russian, Spanish and Arabic. I wanted to buy some Turkish scarves and we wandered around for a bit before selecting one store to look more closely at. As soon as the merchant realises that you could be a serious buyer, they will offer you a tea, that way you will be obliged to stay for longer in the store. This merchant offered us apple tea. I am not a fan of herbal teas, but it tasted really amazing! I choose some nice scarves that I wanted to purchase. 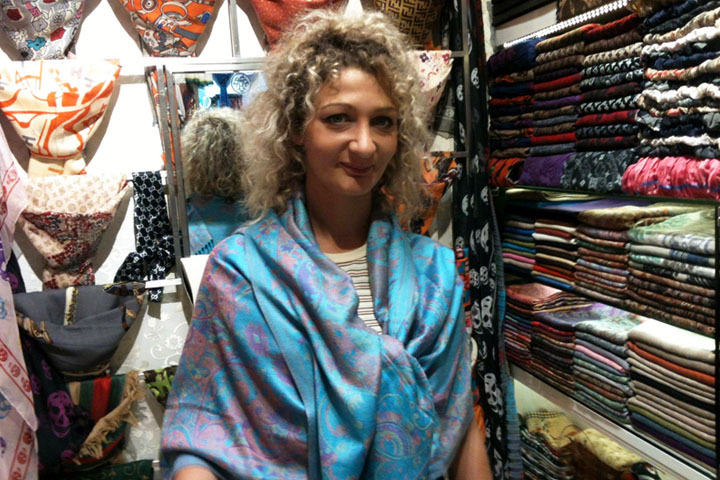 I got 4 pashmina’s of the highest quality and 1 hand-made scarf with embroidery and appliqué. My negotiating skills were not so good at the beginning because I was unsure of what to expect. However I realised here that they are much more fierce than in Hong Kong. I’m pretty sure I got ripped off with my final purchase! Next we visited the Egyptian bazaar, which is famous for selling cheap fragrances, clothing and honey. It also boasts one of the most famous deli’s in the world. We then headed to the Spice bazaar next door which I really loved. Here you could see piles of exotic spices, teas, herbs, nuts and sweets and the smell was amazing. Every vendor will let you sample the goods for free as well. Everyone were tasting things, negotiating prices, chatting, the atmosphere was great. The biggest sellers seemed to be saffron powder, pistachio powder, some kind of dark red powder and Turkish Delight. I purchased some loose leaf apple tea to take back home, because I had really enjoyed drinking it. As we exited the bazaars we came to what is known as the New Mosque in Eminonu. 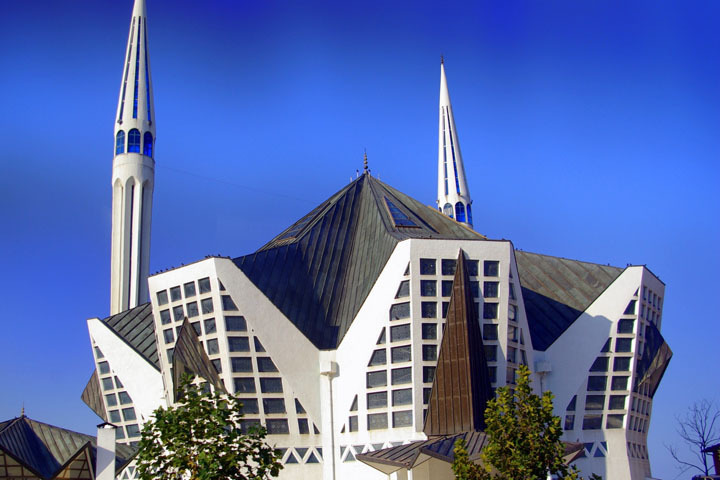 Many people mistake this for one of the more historical buildings such as the Blue Mosque but it is actually modern. Here is also the Galata bridge. Under the bridge are lots of restaurants and cocktail bars, which are mostly open during the day and do not stay open late at night. 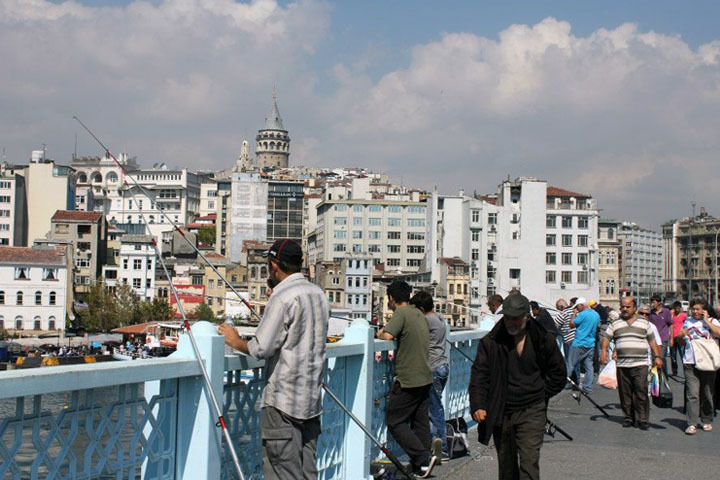 On top of the bridge are locals fishing in the Golden Horn water. People also sell fishing equipment and bait on the bridge. We walked along to the other side where there is a fish market, which is super busy and the place to go for a cheap lunch. The food looked so nice we decided to have a snack, and they fried us some fresh fish on a small BBQ in front of our eyes and served it on a bread roll with tomato, cucumber, onion and lettuce. We wanted to spend some time in Sultanahmet and went to the Basilica Cistern. This is an underwater cistern built by the Byzantine Empire during the 500s. It is very cool and eerie inside and contains over 300 beautiful columns rising out of the waters. There are also fish in the water. The biggest attraction are the two massive column bases that represent the heads of Medusa, however one head is positioned sideways and another is upside down. This has caused a lot of speculation amongst historians. Do you know who Medusa is? There are many theories, but most people believe she was a very beautiful girl who was in love with Perseus. However another girl was also in love with Perseus and out of jealousy made Medusa look very ugly, with snakes for hair. People turned to stone when they looked at Medusa because of her hideousness, so Perseus cut off her head and used it as a weapon to win many battles. 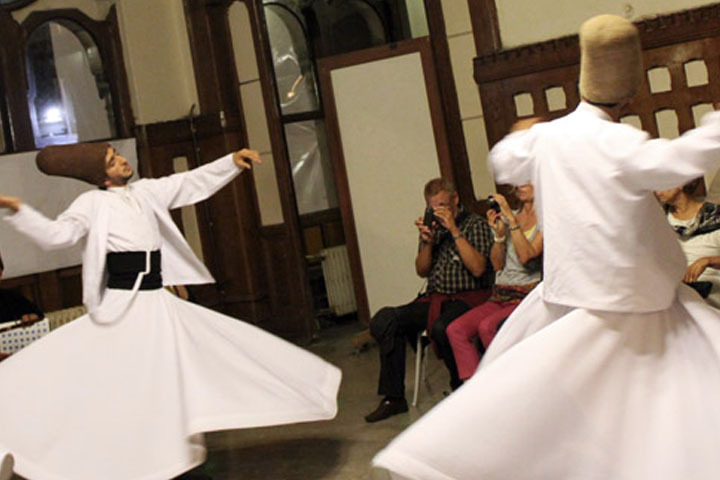 After a few drinks at a rooftop bar from where we admired the Hagia Sofia, we ran quickly to the Sirkeci train station to watch a performance of the Whirling Dervishes, which is a traditional Dervish dance that shows them whirling around in white dresses to praise God. The Dervishes were outlawed in Turkey by Kemal Ataturk during the 1920s. Today they struggle to make money in Istanbul by performing at the train station 3 times per week, or selling souvenirs at the train station. They have only managed to survive by becoming a non-political group, which is why they are tolerated. The performance was really interesting. It started with a band of Dervishes playing an assortment of instruments. The head Dervish then came out wearing a cloak and he wore the tallest hat of everybody. He beckoned other Dervishes to join him and the Dervishes then all took of their coats to reveal their white frocks and proceeded to whirl around like little dolls. The whole performance lasted 1 hour and was very good. We then took a tram to Galata Tower to pass the night drinking and eating with the other youth. We went to the cocktail bar at the base of the tower and we ordered Cosmopolitans which didn’t taste like Cosmopolitans but were delicious. I think they used cherry juice and lemonade to make them. The owner of the bar sat down and had a chat with us. We shared experiences about shopping in Istanbul and he introduced us to the cat that always hung-around his restaurant, which he called Garfield because he was orange and so fat. We all had a good laugh about that before retiring at the hotel. We spent a few more interesting days in the capital Istanbul, where there is so much to see and do.